Our next �vacation station� was Manuel Antonio, home to the National Park by the same name. Our hotel, Arenas Del Mar, is reachable by steep, but passable dirt road (thank God for the 4-wheel drive). It is a secluded hideaway in the rainforest. Our first day alone we saw two sloths, a squirrel monkey and a frog about the size of small cat on the property. Our room had an indoor living room and huge outdoor balcony with upholstered arm chairs and ottomans, cane lounge chairs, and tiled Jacuzzi overlooking the jungle and the private beach and roaring Pacific Ocean below A golf cart came to retrieve us for dinner which was among the best I have had in Costa Rica. Breakfast here is among the best I have ever had and is included in the price of the room . In addition to the choice of a buffet which offers, among other things, the best hone-made pastry selection ever, the menu choices are equally tantalizing. It�s nice to start the day with a smile. Dinner too is such a treat. Using all local ingredients, Chef Angelo Venegas Lara prepared a meal that started with zucchini rolls, amazing macadamia and pineapple pate wrapped in paper thin slices of zucchini, served with guacamole mixed with tree tomatoes and a delicious soy and sesame vinaigrette followed by pepper-crusted fresh tuna drizzled with a coconut sauce and accompanied by frilled eggplant and crispy potato strings. All the dishes were unusual, delectable preparations. Our first day we went ATV-ing with Fourtrex Adventure on a private palm oil plantation. The kids loved the steep winding trails through rivers and mud, passing toucans, iguana and monkeys along the way. We ended our experience at the owner�s home and were served a lunch of chicken, rice, beans and salad in their beautiful tropical garden. When the kids were little I used to judge how much fun they had that day by how dirty they were, and using that measure as a barometer, we had loads of fun. 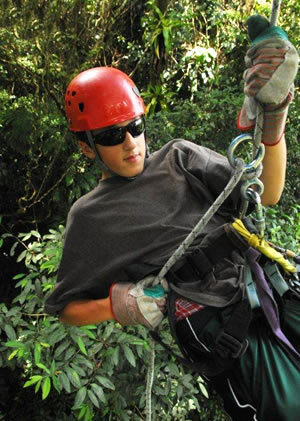 We chose to end our visit in Manuel Antonio with a tour that included ziplines in the canopy. Unlike the thriller joy-ride in Arenal, this experience was more about being a part of the rainforest than soaring above it. The perches were simply wooden platforms fastened to trees at the pinnacle of the forest and the experience included a �tarzan swing� and two rappels as well as the ten ziplines cast in such a way that we could truly imagine what our lives would be like if we were the howler monkeys that surrounded us. Before heading back, I stopped at the Manuel Antonio National Park. I had planned to go on our last day, unaware that the park is closed on Mondays. I was lucky enough to pass a guide on his way home, Leo Godimez. He offered to take me on a popular one hour loop hike before the park closed. Through his powerful monocular on a tripod, I saw wildlife I otherwise would not have seen, including several species of birds, capuchin monkeys and even a strange pink and blue crab whose descendants wandered up from the ocean to the rainforest and never went back, adapting to life on land. The hike winds itself through the rain forest to a secluded beach adorned with nature�s driftwood sculptures. Shaded by the forest, we followed the beach to the last leg of our hike where a fisherman took us the last stretch by boat as high tide made it impossible to complete our journey without a bathing suit. This combination of thick tropical forest abutting the ocean is what makes the experience in this park so magnificent. My struggle with the timing of the visit meant I was there at sunset, a magic hour for photographing the splendor I witnessed. Returning to Arenas Del Mar, I was wet, tired and happy. I treated myself to a combination hot stone, deep tissue massage in their small, but inviting spa. This ended with a foot scrub of honey, sugar, crushed almonds, cinnamon and cream. As I left, I was offered a glass of water with strawberries and mint. Delightfully refreshing. I returned to my room and sat on my balcony, trying to capture my overall impressions of our Costa Rican vacation and why I feel strangely different from on other vacations I have taken. Upon reflection, I am struck by the realization that among other things, this has been a vacation of sounds. In Arenal, it was the sound of volcanic eruptions, periodically punctuated by a clap of thunder and the rush of teaming rain. 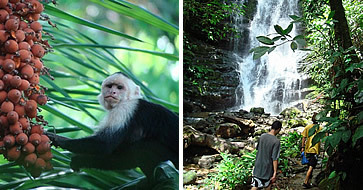 In Manuel Antonio, it is the sound of the ocean combined with the sound of light rain hitting the thousands of leaves of the forest and the howler monkeys communicating their eerie tones to each other across the forest. Perhaps because I am unaccustomed to being �moved� by sound in such a profound manner, it will be my way of remembering Costa Rica and summoning it back when I return to the sounds of the telephone and the doorbell and my computer announcing the next email. For now, I�ll simply close my eyes and try to memorize the rhythmic sensation of the waves and the pattering of raindrops in this luxuriously green rainforest. 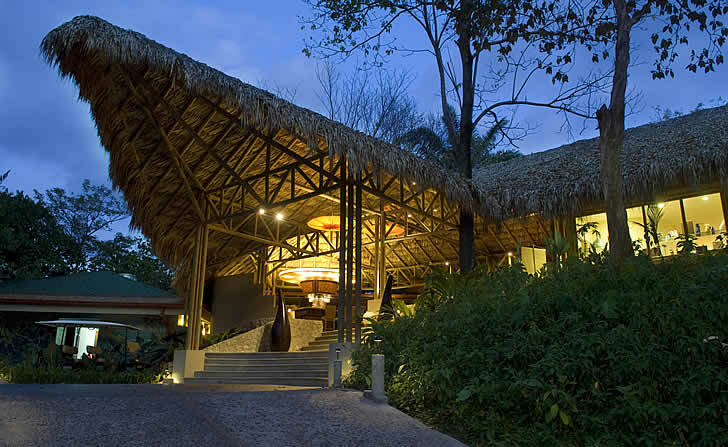 The Arenas Del Mar hotel in Manuel Antonio offers the guest a relaxed beachfront environment on an eleven acre property. Without ever leaving the hotel, you can find many different species of animals, such as the three-toed sloth, iguanas, many species of birds and playful monkeys. Many tours are available and they will arrange to pick you up right at your hotel where you will be driven to the location of the tour. 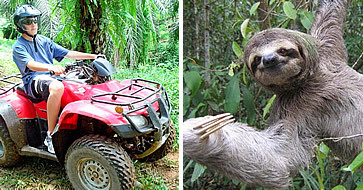 The ATV tour lets you go off-road with a guide to explore a palm oil plantation. Make sure to bring a bathing suit, since you will have the option to swim under a large waterfall in the rainforest. The canopy tour lets you explore inside the canopy to observe nature while ziplining, rappelling and swinging from a rope like Tarzan. 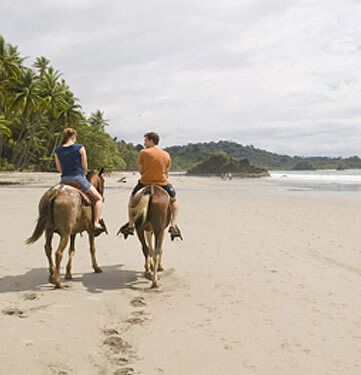 Despite being in a rural area, Manuel Antonio is not too far from San Jose, so don�t worry about missing your flight. Working on the conservation and reforestation of Manuel Antonio National Park. An advanced vermiculture-based compost system to recycle organic waste. Solar panels heat hot water coupled with energy saving auxiliary water heaters. Underground electricity systems that do not interfere with surrounding wildlife. Chlorine free ionization systems to clean pool water. Energy efficient lighting and illumination throughout the entire property. Advanced wastewater treatment systems which assure that all water leaving the property will not affect the surrounding water sources. The use of electric cars on property that significantly reduce carbon emissions. Roof tiles made from discarded plastic bags from the banana industry. Onsite soap production made from leftover cooking oil from the hotel kitchen. Supporting environmental education efforts in the surrounding community. Promoting the concept of sustainable development among neighbors and local community members. Good to know The National park at Manuel Antonio is closed on Monday, the whole month of October, and every day at 4pm. Plan accordingly � it�s not to be missed. Wow factor The seclusion and the combination of being in a magnificent, lush forest while looking at the sea at the same time. The splendor of native � including multiple species of monkey surrounding you. Best rooms or suites to book The units facing the ocean on an upper level. Room for improvement They need a separate air conditioning unit for the living area, but these are going in this year and in the meantime, you can ask for a portable unit. Rates Premium suits run from $450 in low season to $610 in high season. How to get there (From Arenal) Take the Interamerican Highway (Carretera Interamericana) south, towards Puntarenas. Stay on the Interamerican Highway (Carretera Interamericana) until you get to Puntarenas. Once in Puntarenas you have to take the road to Orotina and from Orotina follow the road to Quepos, once in Quepos please drive to Manuel Antonio. Travel Services The front desk can book tours from canopy ziplines, to private nature hikes. 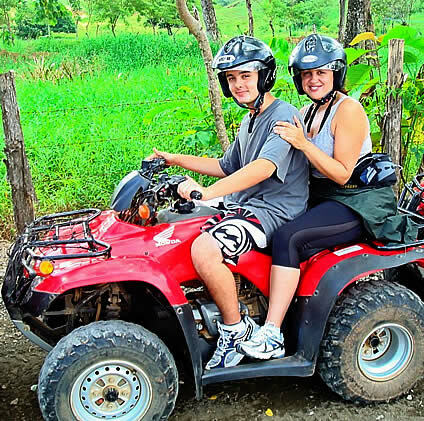 ATV tours are available but are not endorsed by the hotel due to its focus on sustainability. Hi, I am travelling to Costa Rica next monthh. Do you have any rooms available at that time.